I have a booger wall. Yep, a booger wall. I was putting my darling daughter to bed a few nights ago when I glanced up and saw that the wall was covered in snot, boogers and the like. When questioned about her wall decor, she just giggled. A box of tissues was placed by her bed and she was told that a booger wall just isn't that nice in a little girl's room. I spent the next morning "de-boogering" the wall with a putty-knife. I believed that her nose picking habit was nocturnal in nature and that we had solved the problem, but my belief was proven wrong when I then I saw her digging for gold as we walked down the aisle at Wal-Mart. She had really dug out a winner and had it hanging from the end of her finger. ME: It is not polite to pick your nose. I don't have a tissue and you are not going to wipe that on anything. I've had enough and you are going to hold onto that thing until we find a trash can - do you understand me? DAUGHTER: But it's grooossssss - I don't want to hold it. ME: Then you shouldn't have picked it. Now just hold onto it. So our grocery trip continued aisle after aisle with me repeating phrases such as: "You better still have that booger and you better not have wiped that booger or so help me God...."
She didn't hang onto it. It was lost somewhere in the cereal aisle. So you've been warned Jasper Wal-Mart shoppers. 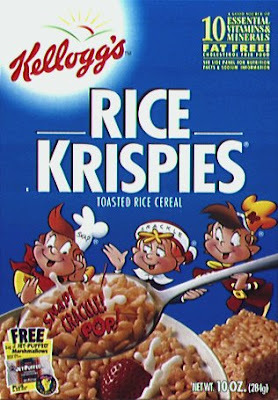 When you go to buy your Rice Krispies you might find the start of your very own booger wall on the side of the box - that's quite a prize. Snap, Crackle, Pop, & Snot. My god, my apologizes. I'll start carrying tissues.